Recently, I started to create a real world app to demonstrate the usage of my WordPressUniversal library. While I was working on it, I also decided to extend the Splahscreen which is mandatory for universal apps.There are several reasons to extend the splash screen, the most obvious is to hide initial data loading. The only sample I found had a separate solution for the Windows and the Windows Phone application, and I decided to put them together to use the advantages of the Shared project that comes with every universal app. This XAML code is the base for our extended Splashscreen. It defines a row height of 180 to place the StackPanel that holds the ProgressRing at the bottom of our control. The main difference here is that Windows Apps use a Canvas while Windows Phone uses Viewbox to hold our Splashscreen Image. We need to set the Visibility on both to collapsed as our code decides which one will be displayed on Launch. Note: if you do not have a Common folder in your Shared Project, you can add it manually and copy the classes from the demo project attached to this project. Don’t forget to change the Namespaces of the classes to your project name after you added them. The Rect is used to place the Splashscreen Image in it and will be sized by our code which we will add later. The dismissed bool is used to determine when the system Splashscreen gets dismissed. The rootFrame is used for the navigation to our first application page, while the splash is used to read the needed values for placing our image into the Rect. The splashcreen tells us the coordinates and the height of the splash image. You can use the loadstate bool to determine data that needs to be restored by the SuspensionManager, if needed. As you can see, we use the preprocessor directive WINDOWS_PHONE_APP to declare the height and width of the Viewbox. If it is not running on Windows Phone, we are setting the canvas coordinates and size via this method. This is not the only point where we need this method, as you will see later in this post. After that, I am declaring when to show Windows Phone’s Viewbox and Windows’ Canvas as well as setting the size of the ProgressRing. The last step is to position and size the image again with our PositionImage() method. This will cause the app to switch to our extended Splashscreen. That’s all of the code we need inside our ExtendSplash control. If you now build the project, it will compile, but nothing will happen. other than going directly to the MainPage. For your convenience, I created a small demo project. Download it here. As always, I hope this blog post is helpful for some of you. If you have questions or feedback, feel free to leave a comment below. Like I wrote in my last post, I recently finished a PCL project with a Windows Phone and a Windows 8.1 app. Like the Windows Phone version, also the Windows 8.1 app has a live tile that fetches the same data from WordPress. Taking advantage of our PCL solution structure, we are able to reuse the JSON data class from our PCL. However, there are a few things that differ from the Windows Phone background agent. First, we need to add a new project to our solution. 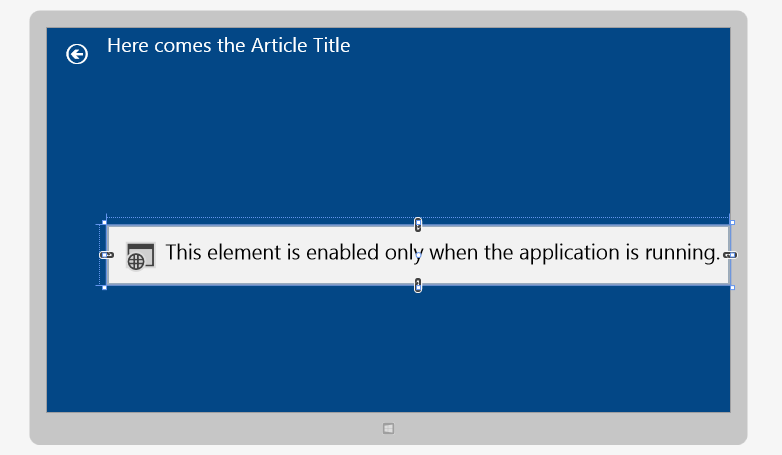 In the new project dialog, select ‘Windows Runtime Component’ in the C# Windows Store section. To make it a background task, implement the interface IBackgroundTask to the generated class in our Runtime component. In order to make it doing some work, we are going to add the ‘Run’-method that will start our background agent. Here we are already with the first difference. The Windows Runtime does not support direct async Tasks of type string (I fetch all articles via HttpClient in an async task that returns the JSON string). That’s why we need to wrap it in an IAsyncOperation. To do this, add a new sealed class to your Windows Runtime background agent project. Let me explain the code. The IAsyncOperation starts and returns the string of our async Task<string>. To achieve this, we need to start another async Run that delegates our Task<string> result to the main background task. Unlike a direct HttpClient call, we are not able to save the string directly to an string object. Instead, we need to read the stream. I highly recommend to wrap this all in try/catch blocks to prevent any crashes of your app. The Run method needs to implement the Interface for IBackgroundTaskInstance. To inform the OS that our background agent may do work after the Run has returned data, we need to use the GetDeferral() method. If we would do that, it may happen that the task will be closed before all action has taken place. After getting the JSON String from the IAsyncOperation, we can now write it to an object, call our UpdateTile() method and tell the system that our deferral is completed. Within the UpdateTile() method, we are going to deserialize the JSON String and update our live tile. There are a lot of considerations for the live tiles in Windows 8 and 8.1, make sure you have read the guidelines for tiles and badges on MSDN. Make also sure you check the tile template catalogue to choose the right templates for your app. //this image has to be in the main Windows 8.1 project, not in the background task! To make the background task updating our tile, we need to use the TileUpdateManager class. As we are updating our main tile, we are using the CreateTileUpdaterForApplication() method. To make sure our tile is able to queue our update request, we are setting the EnableNotificationQueue property to true. After deserializing the JSON string, we fill the Template by using DOM methods. I used the GetElementsByTagName(string) method to find the title and the image ChildNodes in the template. This way, I don’t need to care for the Xml structure. The title content can be set by using the InnerText property. For providing the images source, we need to go through the NodeList, searching for the image NodeChild and use the SetAttribute() method of the XmlElement class. With the code above, the tile gets a placeholder image, if the JSON string does not return an url for the featured image. Important: the placeholder image has to be in your main Windows 8 project, not in the background task project. Make also sure that the image(s) have a unique name and do not use the same file name like your base tile image. That’s all we need to do in our background task project. Let’s have a look at our main app project. First, we have to declare our background task to make our app registering for the periodic notifications. Open the Package.appxmanifest of your app and navigate to the ‘Declarations’ tab. Under ‘Available Declarations’, select ‘Background Tasks’ and ‘Add’. Under ‘Description’ check the ‘Timer’ Option. Make sure you referenced your background task project and add it as ‘Entry Point’. We are calling the BackgroundExecutionManager of Windows 8.1. This adds the Permissions dialog on the app’s first run as well as the entry in the settings charm. Only if we are allowed by the user, our tile will be updated. Unregistering already running tasks and re-adding them is a common practice, which I did also here. After that, I build up a new background task with the BackgroundTaskBuilder class, referencing to the taskEntryPoint I set up in the Declarations tab before. Unlike the Windows Phone background agent, we can change the time of the background task. I used 60 minutes for this app. You will need to specify a trigger (minimum of 15 minutes). I tried it without, which lead to an exception. I am catching all exceptions and display a message to the user here. The method will be marked as executing synchronously, but it will work. The reason is that no async methods are allowed in the catch block. Like always, I added this to my App.xaml.cs file, as this is set up application wide. To start the task, I just call it in the Application.Launched event. It would also work in the OnWindowCreated event, if you want your Launched event free. Setting up a background task to update your live tile with data from web is not as easy as on Windows Phone, but with this article you will be able to get started on that. As always, I hope that this post is helpful for some of you. Now that my current app project is near to go live, I will start a new series about how to get productive with Windows Azure Mobile Services (WAMS). I will cover some interesting topics in this series, which are not really documented in the very well written “Getting started” series from the Azure team itself. The tutorial makes you very easy and fast using WAMS. What can you expect from this series? As always, I will add some of my personal experiences during my journey of creating my app. There were a lot of small stones in my way, and I will also tell you how to remove them. And of course I hope that my posts will help some of you to get their own WAMS story started.